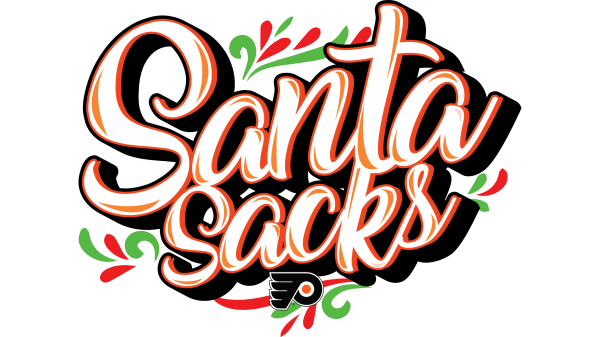 Santa Sacks – The Ultimate Flyers Gift for Philadelphia Flyers Fans this Holiday Season! Looking for the ultimate gift for your favorite Flyers fan? Look no further! With Flyers Santa Sacks, you are sure to score big points with your recipients this holiday season! Starting at $165, the standard package includes 2 select game tickets (all games in the second half of the season are available), An autographed puck, which comes with a certificate identifying who has signed the puck, vouchers for game night concessions and other great Flyers-related deals! You also have the option to upgrade for an additional charge to include an autographed Stick Pack, 4 select game tickets on the Club Level, and an autographed Flyers stick from one of select Flyers – Travis Sanheim or Robert Hagg! Santa Sacks are “The Ultimate Flyers Gift!” all starting at $165 and can be conveniently purchased HERE, on the concourse during the games or at the Wells Fargo Box office! Tickets are on sale now through December 31st!